No one wants a defective transmission. It typically means a broke down vehicle, expensive repairs, and a big headache. This is exactly why regular transmission maintenance is so important. Keeping an eye on your transmission and looking out for any potential problems can help you fix minor problems before they become full-fledged (and expensive) repairs or replacements. Curious what problems you should be looking out for? In today’s article, we would like to share with you five key automatic transmission problems. If you spot any of these problems, it is important to get your vehicle to an experienced mechanic right away. If you are in the Houston area, bring your ride into Tran Star Transmission, Houston’s go-to transmission shop. For over 25 years, we have been keeping people safe and their cars running great. We are a full-service transmission shop, providing transmission repairs, replacements, rebuilds, fluid changes, and free diagnostic checks. Learn more about us, our transmission services, and contact us today to get started! For transmissions to change gears, stay cool and lubricated, and operate effectively, transmission fluid is absolutely necessary. While the life of fluid can be quite long, it doesn’t last forever. How long exactly your fluid will last depends on the condition of your transmission and the type. Regular checks are a crucial part of making this assessment. When inspecting your fluid, look for fluid that is dirty or burnt and fluid that is dark brown or black. If you notice these issues, it’s a sign of contamination and an indication that it’s time for a change. Good fluid is a pinkish red and nearly transparent. Just as important as the color and condition of the fluid, the level of the fluid is crucial as well. For an automatic transmission to work properly, it requires a certain amount of automatic transmission fluid. When levels become to low, this can cause transmission slipping, shaking, problems with shifting, overheating, and an overall failure. Mechanics are not always necessary to check levels. Many cars are equipped with a transmission fluid dipstick that makes the evaluation as simple as checking the oil. However, for some vehicles, a lift or jack is required to check the levels. If levels are low, the solution, of course, is to add more. But it is also just as important to check for leaks — which can be another red flag for transmission problems. While some puddles under the car, like water from the AC, are innocuous, other puddles can be good reasons for concern. One such puddle is a puddle of transmission fluid. If you spot a puddle of red liquid under your car, it’s time to get your vehicle into a transmission shop. When leaks are not remedied, you are bound to run into issues related to driving with low fluid levels. The most common sources of leaks include areas around the seals, transmission lines, loose pans, or faulty gaskets. Overheating may be the worst thing you can put your transmission through. Unsurprisingly, this is one of the most common culprits of transmission failure — some estimate that this is the reason for 9 out of 10 failures. The fluid is the lifeblood of your transmission. When the fluid is not in good condition or not at an optimal level, this can cause the transmission to heat up. Other factors like the climate, heavy towing, solenoid problems, and lots of stop-and-go driving can all increase the risk of overheating. As a general rule, for every 20-degree increase in temperature, your transmission’s life can be cut in half. A transmission stays in a designated gear until it is shifted by the driver (in the case of a manual transmission) or the computer (in the case of an automatic transmission). When your transmission spontaneously slips in and out of gear or pops into neutral when you didn’t tell it to, this is obviously a problem and a serious danger. 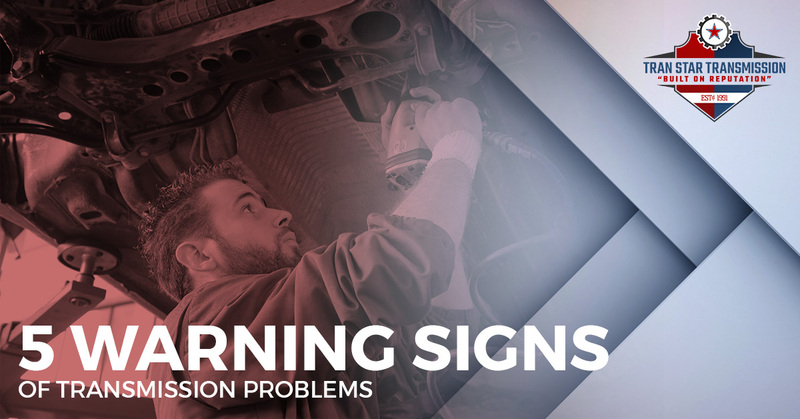 There are a number of reasons why slipping occurs — inefficient fluid, bad solenoids, clutch problems, defective gears, and more. If you experience slipping, this is something you should absolutely not ignore. Ideally, you want to get your vehicle into a transmission shop and drive as little as possible. Your vehicle’s transmission is one of the most integral components of your vehicle. It contains hundreds of sophisticated parts that work together to change gears and power your automobile. To keep your car or truck from malfunctioning be on the lookout for any potential problems and get your car serviced regularly. If you are in the Houston area and are experiencing any of these problems, stop in and see us! We can handle all of your transmission repairs, replacements, rebuilds, fluid changes, and services. Don’t ignore transmission problems. This will only lead to more expensive and inconvenient problems down the road. Come see us today to take advantage of our free transmission diagnostic check.